FARMINGTON HILLS, Michigan, Jan. 8, 2019 /PRNewswire/ — The American Concrete Institute (ACI) announces the opening of its regional office in Dubai, United Arab Emirates. The grand opening celebration on January 6, 2019, marked the Institute’s first physical presence outside of the United States since its inception in 1904. The Middle East Regional Office, headed by Ahmad Mhanna, ACI’s newly appointed Middle East Regional Director, will focus on advancing the development, dissemination, and adoption of ACI consensus-based knowledge on concrete and its uses in the region. “This office will lead efforts to establish and nurture a wide range of strategic relationships between ACI members, chapters, companies, governmental bodies, educational institutions, partners, and other construction industry organizations throughout the region and beyond,” stated Mhanna. 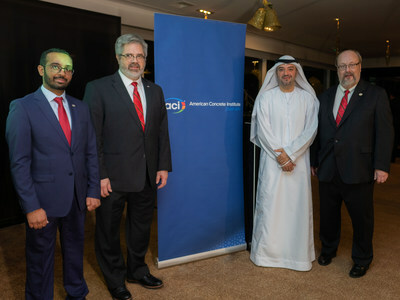 The event was celebrated during an evening reception with honored guests including Hassan Al Hashemi, Vice President, International Relations, Dubai Chamber of Commerce and Industry, and David A. Lange, ACI President. ACI Executive Committee members Khaled Awad (ACI Past President), Jeffrey W. Coleman (ACI Vice President), Randall W. Poston (ACI Vice President), and Ronald G. Burg (ACI Executive Vice President), welcomed guests at the event. The new office is located on level 7 of the Dubai World Trade Center, Dubai, UAE. For more information on ACI’s activities in the Middle East region visit concrete.org/MiddleEast. Follow @ACI_MiddleEast on Twitter and like @ACIMiddleEast on Facebook. Always advancing – Founded in 1904 with a headquarters in Farmington Hills, MI, USA, and a regional office in Dubai, UAE, the American Concrete Institute is a leading authority and resource worldwide for the development, dissemination, and adoption of its consensus-based standards, technical resources, educational & training programs, certification programs, and proven expertise for individuals and organizations involved in concrete design, construction, and materials, who share a commitment to pursuing the best use of concrete. For additional information, visit concrete.org.